Mustang Cruisers NZ has made a commitment to its product and the New Zealand market, landing a full range of the Australian-built sports cruisers. Steve Raea samples the flagship 4600 Sports Top. Finding acceptance in the New Zealand domestic market for imported sports cruisers can be a long and difficult road, as many dealers would testify. While the build quality and finish of some imported brands plays a hand in buyer reluctance, it is more often than not the stigma associated with the word "imported" that causes buyers to flinch. 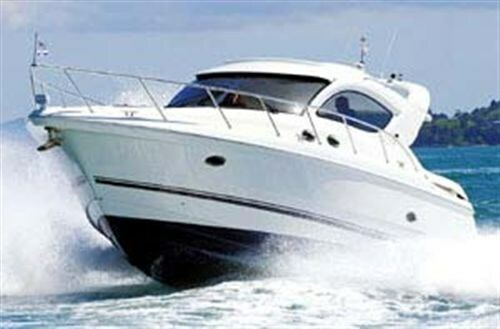 Only in recent years have New Zealanders had genuine access to imported sports cruisers from respected builders such as Australia's Riviera Group, Mariner, Mustang and Sunrunner Cruisers, to name but a few. Interestingly though, none, with the exception of Riviera, have sold particularly well in this country. It is curious, however, that these same brands are finding ready acceptance in Asian and North American markets where export demand is driving growth and setting production levels. Mustang Cruisers New Zealand importer and agent Frank Coggan, believes it is only a matter of time and education before New Zealand buyers recognise the benefits that imported production brands offer in terms of onboard amenities, price, performance and resale values. To this end, Coggan and Mustang Cruisers (NZ) have made a considerable investment in landing a number of leading Mustang models into New Zealand. The latest of these to arrive is the Mustang 4600 Sports Top, a flagship model both here and in Australia. It is a boat that illustrates the many benefits associated with production boat building, in so much as it carries a staggering list of equipment fitted as standard. Examples include hydraulic lifting engine hatch and boarding platform, tripple reverse-cycle air conditioning plants, bow thruster, 11 KVA genset, three flat screen LCD TVs, DVD and Bose surround-sound stereo. The list goes on to include radar, autopilot, GPS/plotters, remote spotlight, trim tabs, and electronic seating. The mechanics are equally impressive with twin 450hp Cat diesels, fly-by-wire electronics, V-drive twin-disk gearboxes and hydraulic steering. Add up the cost of the standard features and you begin to get an appreciation of the value of production- built boats. Any niggling doubts about build quality should be countered by Mustang Cruisers' comprehensive 10-year structural hull warranty and the company's CE rating. Construction details include a solid GRP hull with marine plywood reinforced stringers glassed into the hull to provide stiffness to the running surfaces. The deck is glassed to the hull and the internal bulkheads are bonded to the hull. The interior styling comes chiefly from top of the line Italian fittings and cherrywood joinery set off by Mustang's own range of soft furnishings that extend to leather in the saloon. The Mustang 4600 is a close as you might get to an inner city apartment. It is a boat designed to cater for two couples in complete privacy, offering two queen size berths in separate cabins, each with their own private ensuite. 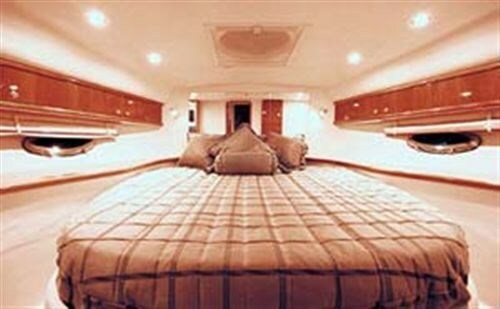 The saloon and galley are large and airy with acres of headroom. A theme common throughout the boat is the use of soft, flowing curves to accentuate the feeling of space. This has been used to maximum effect in the saloon with its tear-shaped cherrywood dining table and wrap-around leather couch. The table is mounted on an adjustable pedestal that, if required, forms a third double bed. The high-gloss finish extends to the teak and holly galley floor, galley cupboards and drawers. The galley bench top is Corion and is set off with polished stainless and gold fittings. Galley facilities are impressive with a 12-volt fridge and separate freezer, 240-volt two-burner hob and conventional microwave oven. The cook is well catered for with a flat screen television, air conditioning control panel and pull-out range hood. The master cabin is in the bow and has all the features you might expect, plus a few more. Lighting is a theme with halogen down lights and strip lighting under the bed for those special occasions. There is plenty of space for personals, with drawers set under the bed and a large hanging locker with internal lighting. The bed is large and inviting with fitted Mustang bedspread and mirrored headboard. Getting in and out is child's play courtesy of teak steps each side. The European overhead hatches, complete with flyscreens, cast plenty of natural light and there is a view through the stainless portholes on each side of the hull. The boat is fitted with white carpet throughout, which might not be as practical as it is stylish. The internal mouldings and cream padded headliners give the boat a classy finished look. The master bathroom has two doors, one from the central companionway and the other from the master cabin. The bathroom features a separate circular shower stall with solid teak grate. Standard fittings include Leactra San onboard treatment, high-gloss veneer joinery, gold tap fittings, Corion vanity top and an exhaust fan to keep things dry below. While not the biggest in its class, the WC is modern, airy and user-friendly. The guest cabin is located under the cockpit and features a generous double berth set amidships. The quest bathroom doubles as a day head and is located in the aft port quarter. It, too, has a separate circular shower stall. While there is no standing headroom over the guest berth, there is plenty of room to sit up and read the Sunday papers. Guests are well catered for storage wise and have their own flat screen LCD TV and personal air conditioning control panel. The entertainment hub of any good sports cruiser is the cockpit and it is here that the Mustang 4600 comes into a class of its own. The sports top - what we New Zealanders call a hard top, is beautifully moulded and set high off the cockpit sole, giving a feeling of immense volume and space. It is a classy piece of workmanship and carries the shapely theme common to the boat. Push a button and the sunroof slides back into a recess, flooding the aft lounges and helmstation in natural light. The cockpit has three distinct areas - four if you count the wide boarding platform. The helmstation is on the starboard side and features a futuristic matt grey moulded instrument panel with air conditioning ducts, carbon fibre dash, drink holders and wine buckets. The laminated windscreen blends seamlessly in to the overall shape of the sports top. Opposite the helm station is the forward lounge. This is set out in semi-circular fashion and is set up high off the cockpit sole thus giving headroom in the aft stateroom. The outdoor squabs are all in white crisp vinyl with generous rolled edges. Directly behind the helm station is the amenities centre where guests and owners will gravitate all summer long. This area is feature packed and includes an electric hot-rock barbeque with splash back, sink with hot and cold water, ice maker, fridge and fully enclosed rubbish locker. The whole area is boarded by a stainless steel fiddle rail to keep things in place when on the move. Further aft and to starboard, is the aft lounge. This features a semi-circular aft lounge set around a moulded table with inset drink holders and mounted on an adjustable plinth. The entire cockpit sole is fitted with a synthetic teak and holly-look carpet that can be quickly and easily removed for cleaning or when fishing. There are many smart features, but none more so than the hydraulic engine access. Getting into the engine room is a simple case of lifting the carpet in the aft lounge and pushing a button in the transom locker. The whole aft lounge lifts up on a single ram giving easy access to the two big Cats below. The other advantage is the natural light that floods into the engine room. A disadvantage is the difficulty one has accessing the rest of the boat once the sole has been lifted. Another version on the theme is the hydraulic dive platform that can be remotely lowered about four feet below the surface of the water. Divers would kill for this feature and what better way to test the water without committing fully. The swim platform is wide and long and begs for a couple of deck chairs at happy hour or bronzed bodies on towels during the heat of the day. Mustang knows a few things about lying around and to this end has incorporated a huge sun pad on the foredeck. Simply drag the canvas mattresses on deck and zip them in place. The foredeck is wide open and clean with the remote windless and anchor locker neatly concealed below deck level. Clever ideas abound here, too, with provision to store three large fenders in the anchor locker. One couldn't help but feel like Mario Andretti sitting up high in the helm station with all those instruments and gauges set out in carbon fibre mouldings. The Momo wheel and stainless remotes have performance written all over them. I got my hands on the wheel on a glorious late spring day on Auckland's Waitemata Harbour. With little wind and no sea to speak of, the big Mustang proved a willing partner with oodles of grunt throughout the rev range. The view out front and side windows was crystal clear with no hint of glare from the windscreen or dash panels. Better still, the boat rides flat, extending the view forward as far as the eye can see. 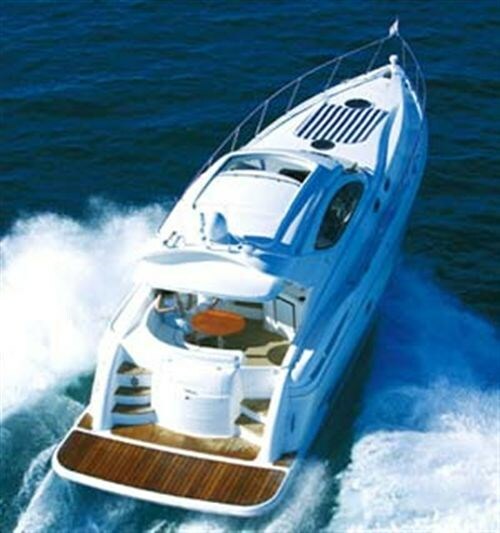 Put the hammer down, sit back and watch the miles peel off as the boat moves through 26 knots at 2500rpm. For the budget conscious, a fast cruise of 22 knots at 2250rpm might suit better, but I challenge you to resist the temptation to get those two big Cats roaring. 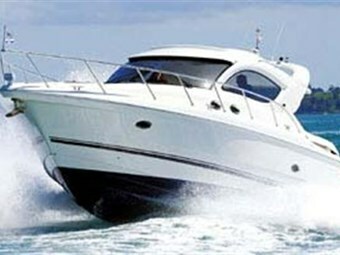 The boat is a lot of fun to drive and is not afraid of being put into tight, hard turns. I wouldn't hesitate to describe the 4600 as a drivers boat. But that doesn't mean the inexperienced will run into trouble. It does everything asked of it and feels surefooted and purposeful. And forget any notion that this is a fair weather friend. While our harbour foray was in gentle waters, Mustang Cruisers have been well proven in the rough. The company makes a great deal of the fact that they build boats expressly for New Zealand and Australian coastal conditions. From a sailors perspective I would have liked to have seen a few more things to hold onto down below, especially in a seaway. The 4600 is a big boat with a big appetite for adventure, whether it be weekending at the Viaduct Basin or streaking across to the Barrier. It offers the best in indoor and outdoor living and will cope admirably with typical coastal conditions. My only gripe would be the standard of finish in some places, but these were only minor in nature and are largely typical of production built boats.